Place flour and salt in food processor bowl. Add oil and 1 egg and pulse for 30 seconds. Add another egg and pulse again. Add last egg and work until dough is thoroughly mixed 1 to 2 minutes. Turn dough onto floured work surface and press it into a ball. Knead the dough until it is elastic - 5 to 10 minutes. Press into a ball and cover with upturned bowl. Let it stand at room temperature for one hour. Cut lobster tail into thin slices. Reserve 6 slices for garnish and chop the remaining lobster. Mix it with onions, ricotta, salt and pepper. To assemble ravioli, quarter pasta dough and roll a strip about the thickness of a postcard. Trim the strip of dough to a width of about 5". Cut the strip across in half. Brush one rectangle very lightly with water. Arrange small amounts of lobster filling on the moistened dough, spacing about 2" apart. Lay the other rectangle of dough evenly over the filling. Press down between the mounds of filling to seal the dough. Cut into squares with a pastry wheel. Spread raviolis on a floured cotton towel and sprinkle tops with flour. Continue procedure with balance of pasta dough. Let dry 1-2 hours; To cook ravioli, fill a large pot with water and bring to a boil. Add ravioli and simmer until tender but still chewy. Stir occasionally to prevent sticking. Melt butter in a heavy saucepan, add cream and saffron and heat to a rolling boil. Add Parmesan cheese and simmer until cheese melts. 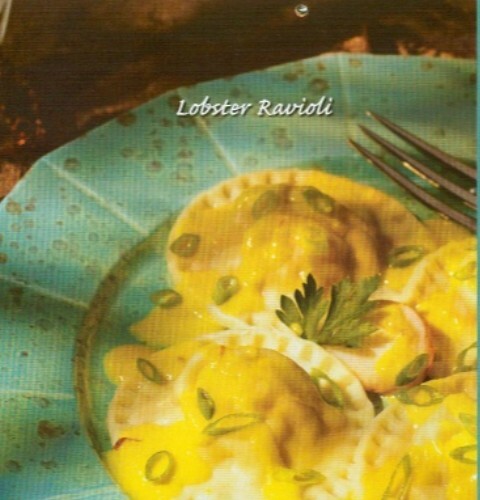 Arrange ravioli on serving plate and cover with sauce. Serve immediately.